Governments concerned about the sudden visibility of political, economic and military locations exerted considerable influence on suppliers of this imagery to censor sites deemed vital to national security. This form of censorship continues today and techniques vary from country to country with preferred methods generally including use of cloning, blurring, pixelization, and whitening out sites of interest. Surprisingly, one of the most vociferous of all governments to enforce this form of censorship were the Dutch, hiding hundreds of significant sites including royal palaces, fuel depots and army barracks throughout their relatively small country. 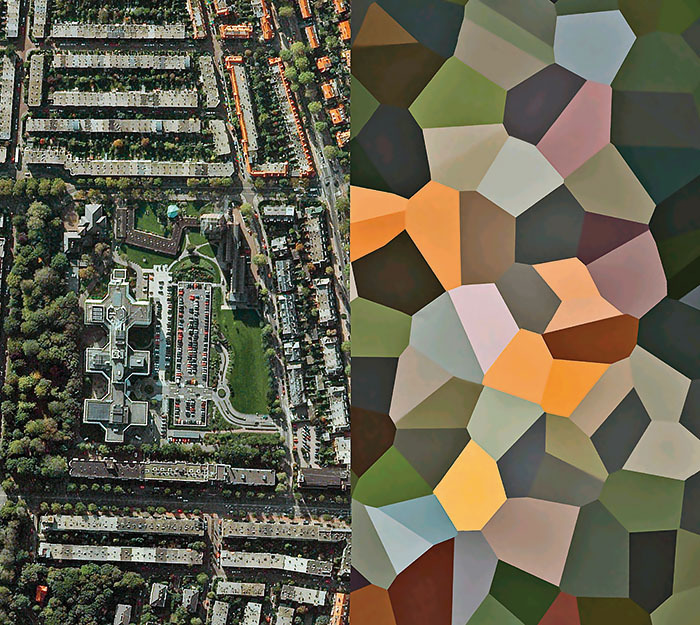 The Dutch method of censorship is notable for its stylistic intervention compared to other countries; imposing bold, multi-coloured polygons over sites rather than the subtler and more standard techniques employed in other countries. The result is a landscape occasionally punctuated by sharp aesthetic contrasts between secret sites and the rural and urban environments surrounding them. 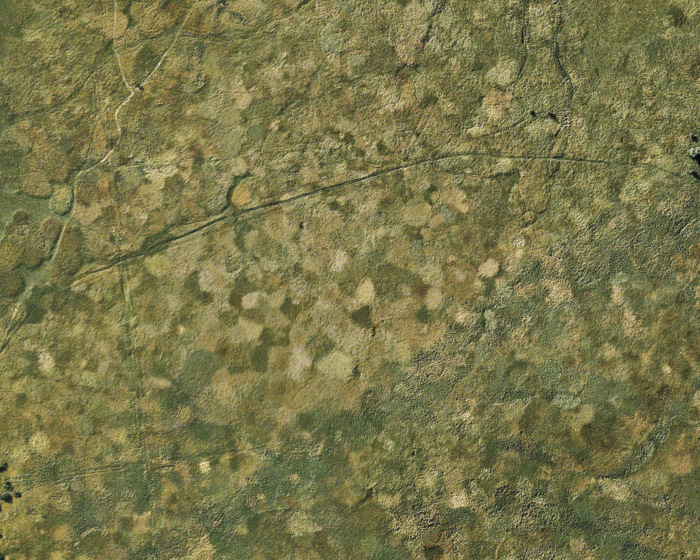 The technique is reminiscent of the "micropatterns" on military camouflage, which mimic poor-resolution digital photography. "Micropatterns" are not designed to hide soldiers from direct human eyesight. Instead, they allow soldiers to blend more easily into contemporary surveillance images. 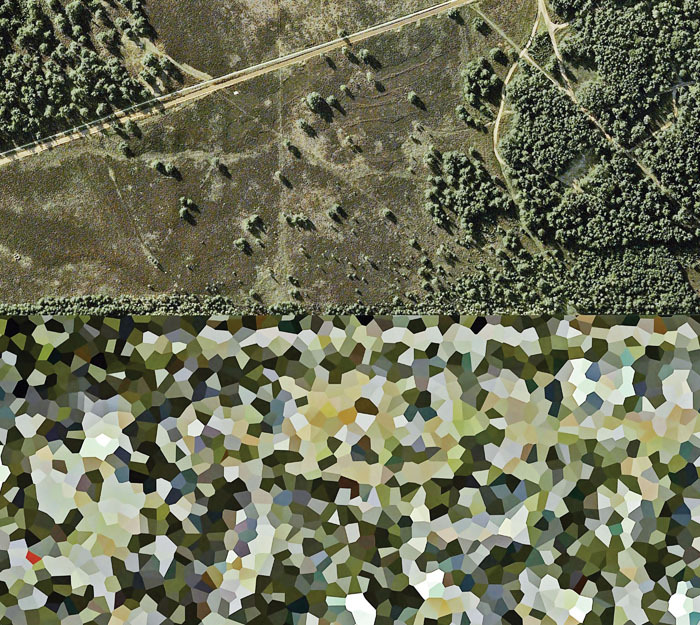 Yet the Dutch process of landscape camouglage carries other diverse implications. Henner also emphasizes that the digital alteration of the landscape comes head to head with the physically altered landscape, visible in many of the photographs. 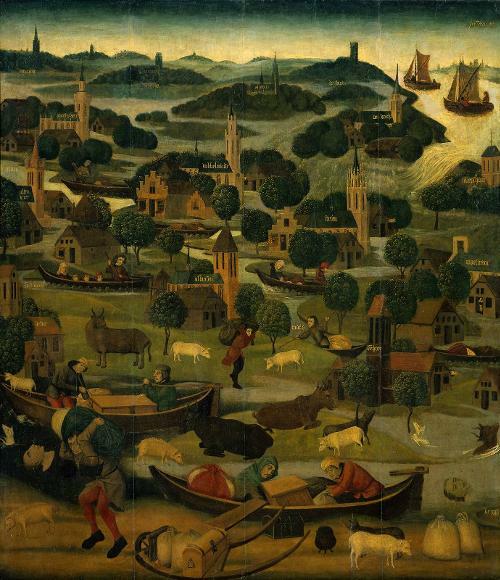 The Dutch landscape has been shaped since the 16th century by "dunes, dykes, pumps, and drainage networks" that have kept the nation above sea level. Those transformations protect the Netherlands from the menace of water, while the digital alterations protect the country from "an imaged human menace" looking to harm the country. These new landscapes serve as modern analogues to the genre of Dutch landscape painting, specifically the pre-Golden Age Neatherlandish paintings, which depicted landscapes from an impossibly high angle and eschewed slightly the later depiction of impressive cloud formations. Those artists have their own set of formal interventions to create visually new landscapes. Their strategy is one of scope and proportion, not superimposed polygons. These paintings also concern themselves with transformations in the physical landscape: the fist records a devastating flood (perhaps an impetus for later preventative changes to the terrain), while the second depicts a harvest that is the result of human cultivation of the land. 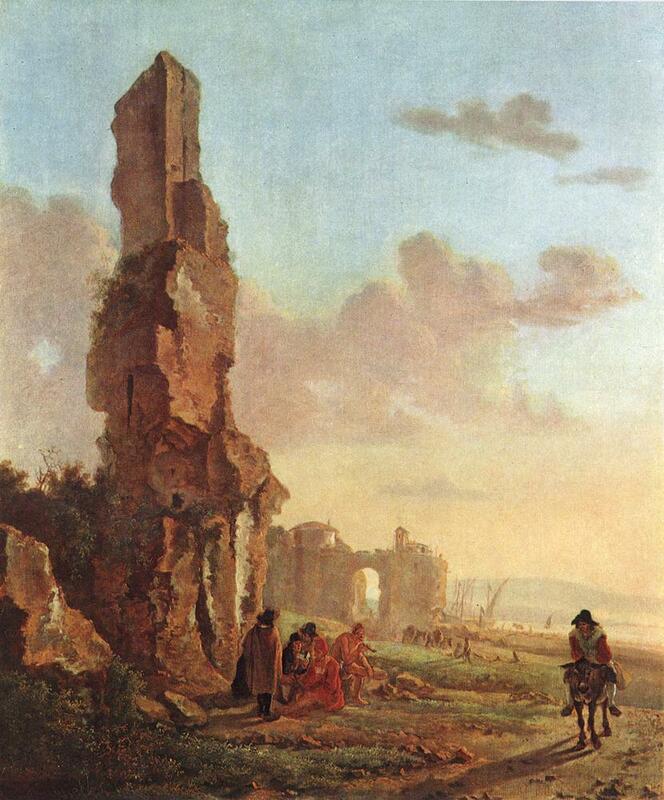 Later Golden Age landscape paintings relished in the depiction of romantic ruins, as in the beneath painting by Jan Both. Those paintings fetishize the remains of a structure that has been devoured by history--in this case, a romantic, synthetic history. The depicted ruins needed not correspond to specific sites of historical relevance. Instead, they served as gateways to modes of life with historical significance and offered an experience of sublime contemplation. 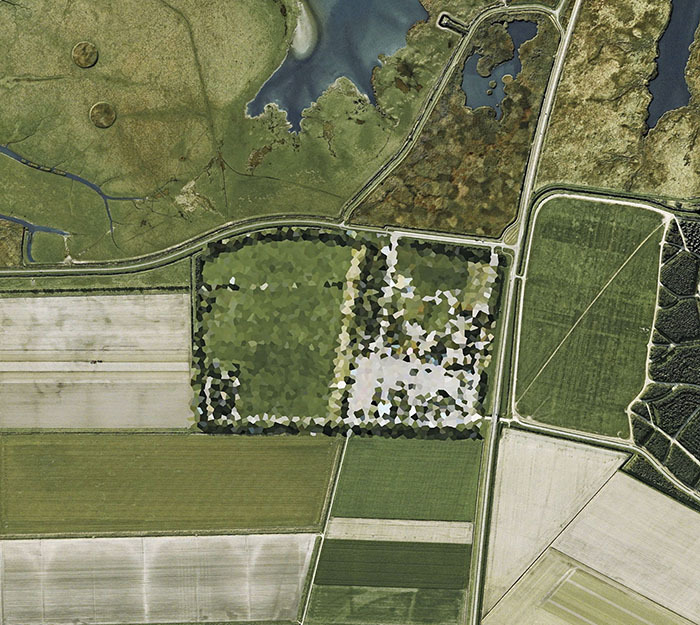 The fascination with contemporary Dutch landscape censorship creates new, synthetic ruins. The abstract forms hovering over aerial images are an information ruins: locations that have been swallowed by a paranoiac security state. They become new objects of contemplation, suggesting a magnitude of significance to the sights which necessitates their remaining unseen. The weight of history is replaced with the burden of surveillance, and physical alteration is replaced with digital concealment. Yet Henner's collection helps us recognize that all changes in visuality and technology birth both new ways of seeing and new things to be seen. 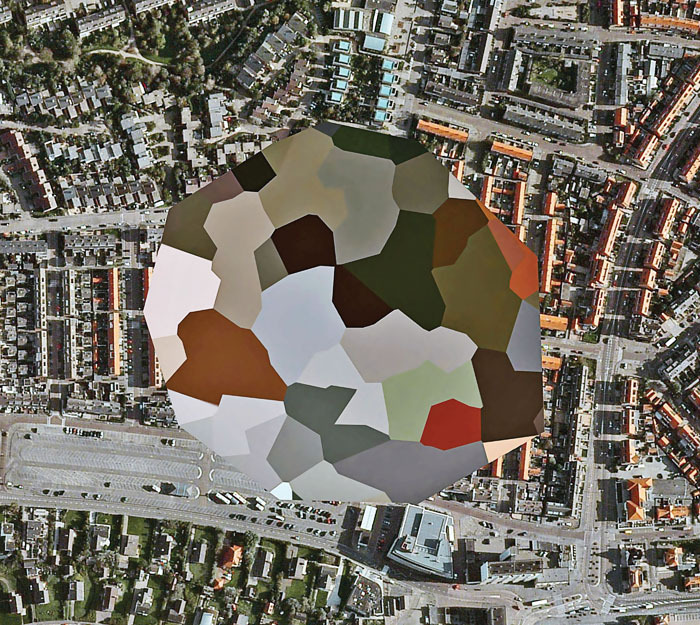 All aerial images collected by Mishka Henner.